We interrupt our regularly scheduled 'Today's Words of Inspiration' to bring your attention to a company who is working with an amazing cause! If you are central to New York City you won't want to miss this! 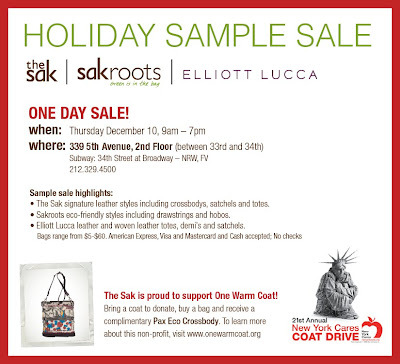 The Sak is working with New York Cares to give back during the holidays. Any customer who brings in a coat and makes a purchase will receive a free crossbody from The Sak! New York Cares meets pressing community needs by mobilizing caring New Yorkers in Volunteer Service. Did you know that 90% of homeless adults need a new, warm coat each winter because they have no place to keep one over the summer months? But it's not just homeless people who need our help; thousands of New Yorkers each year are forced to make a choice between buying a winter coat and putting food on the table, or meeting other basic survival needs. New York Cares collects nearly 70,000 gently used winter coats each December and distributes them to thousands of men, women, and children who would otherwise be cold. For more information regarding New York Cares annual coat drive, press HERE. Sample sale highlights: The Sak signature leather styles including crossbodys, satchels and totes. Sakroots eco-friendly styles including drawstrings and hobos. And Elliott Lucca leather and woven leather totes, demi’s and satchels. Amazing deals for you, and the opportunity to help those who need help the most this time of the year. WIN/WIN situation all around, and very much in line with the 'reason for the season'. Our words of inspiration today? simple, remember the season of giving by helping your neighbor! Attitude really does determine Altitude! This is NOT a Paid Insertion! I did NOT receive any compensation of any kind for this post. All opinions expressed here are my own! $25 Kohl's Gift Card Giveaway!